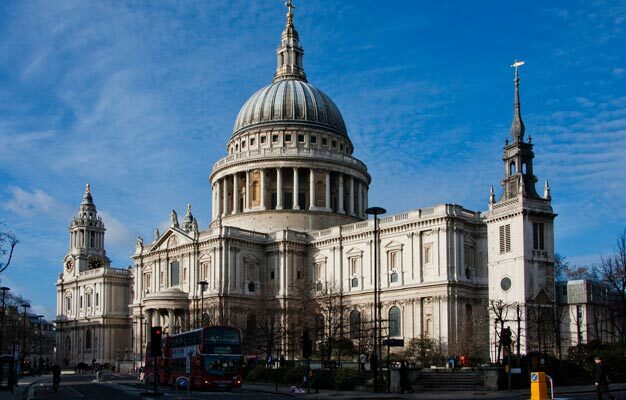 Visit the iconic landmark St. Paul’s Cathedral and learn about its fascinating history. With pre-booked tickets you can skip the long lines and just walk straight in and start exploring the cathedral. St. Paul's Cathedral is the fifth cathedral build on this location. The first burned down to the ground in the great fire of London in 1666. St. Paul's Cathedral is one of the biggest churches in Northern Europe, and is built as a giant cross with the famous dome in the middle. Try a multimedia guide included in the admission price for all visitors. The guide uses film, new photography as well as a detailed commentary to offer an effective interpretation of this unique landmark. The multimedia guide is available in English, British sign language, French, German, Italian, Spanish, Portuguese, Polish, Russian, Mandarin, Japanese and Korean. There are daily free tours of the cathedral floor and crypt led by cathedral guides at 10 AM, 11 AM, 1 PM and 2 PM. You can join these on arrival at no extra cost. A tour last 90 minutes (spaces are limited per tour). Get an eye into St Paul’s with state-of-the-art projection technology and immerse yourself into the fascinating history behind this iconic landmark. The Oculus is an award wining 270° film experience that brings 1400 years of history to life right before your eyes. When you book your tickets, choose the date you arrive in London as the 'Valid from' date. Your tickets will be valid one week from the 'Valid from' date. Choose number of tickets and click on 'Search'. Then you choose the number of adult or children's tickets you need. Children's tickets are only available together with adult tickets. Then you choose to add tickets to other attractions or transportation in London to your purchase. Shortly after your booking is complete your e-ticket will be send directly to your email, just print it out and bring it with you to St. Paul's cathedral. When you get to St. Paul's Cathedral you need to exhange your e-ticket before entering. Please note that the person who booked the ticket(s) need to bring a photo ID (e.g. a passport), when exchanging the tickets. - In case of special events the cathedral can close down to be public with short notice.